"The Color Red." - NEW! A humorous slide lecture. From a very young age, I loved the color red. 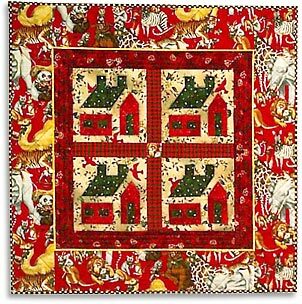 View slides of my childhood spent in England and Morocco and over the depth of a lifetime of quiltmaking – see how the color red has worked its way into my work without any conscious effort on my part! An introduction and example to discovering your own personal color preferences. A few quilts and wearables will be shown after the slides. Retrospective Trunk Show - A truly moo-ving experience. 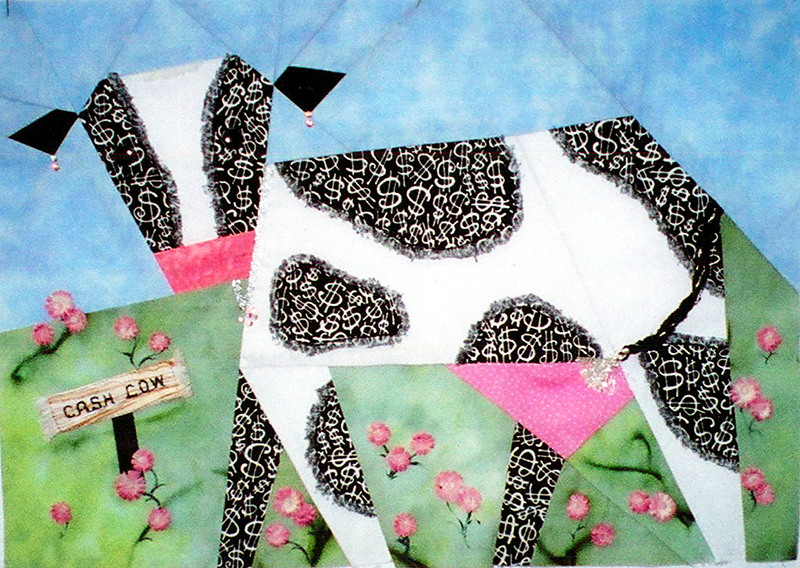 Utilizing Holstein cows in my designs was a natural for me even before moving to Moo-desto. The graphic black and white patterns on these cows and their gentle nature appeal to me. During this presentation that includes 21+ years of original work, quilts are shown, and garments are modeled by volunteers. Each article is described in detail using a humorous, and relaxed commentary. Any questions you might have about techniques, materials used, and trade secrets will be answered! Accept The Challenge! - A slide lecture. Learn to say "yes" when you are asked to participate in a challenge that will lead to growth and increase your comfort zone. 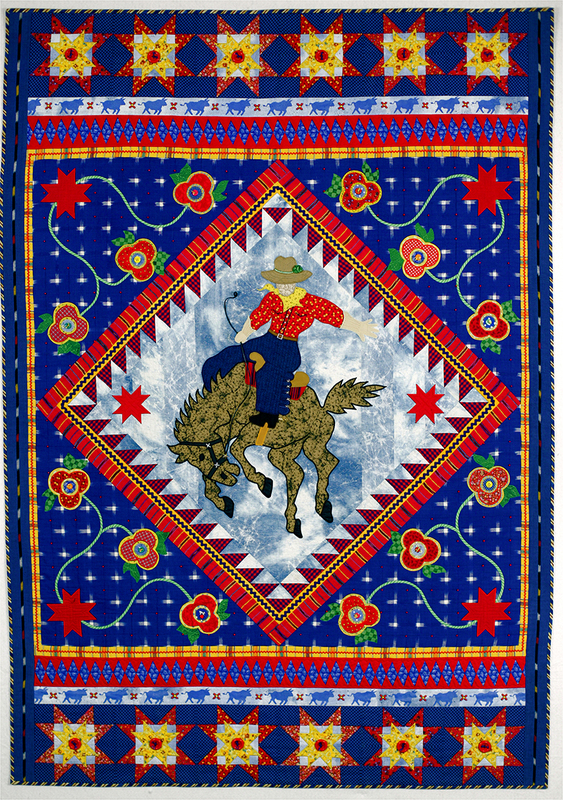 While showing slides of original quilts and garments, I share personal experiences that led to their creation. Design solutions to challenges are discussed. A few special pieces on hand for your group's examination! Learn beginning machine appliqué and end up with this charming 16" x 20" wall quilt for your new baby or grandchild. You will learn appliqué techniques of: satin, blanket stitch, Cathie's "reverse appliqué by machine" (using no fusible), mock hand appliqué, and several easy ways to create perfect circles while making "planets." You will learn the pros and cons of using fusibles and Cathie's recommendations on which ones to use and when to use them. All techniques will be demonstrated in class, and students will receive complete printed instructions covering all techniques. 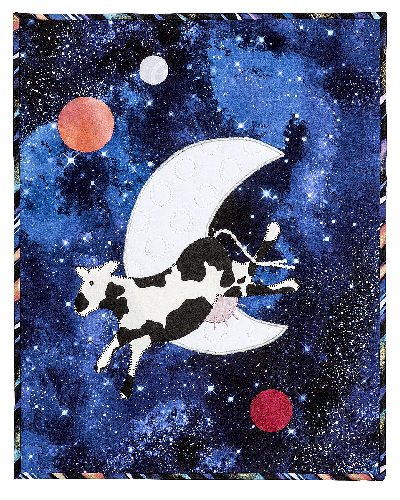 Kit includes: All fabrics for: the incredible universe background, one Holstein cow, one moon, three planets (Jupiter, Mars and Venus), batik backing and comet fabric for binding. "Thank you for making our guild meeting such a fun night!! Everyone had a great time (I could tell because so many stayed right to the end!!). Your garments and quilts were really great!!" Julia R.
"As someone relatively new to both sewing and teaching sewing classes, I so much appreciated your skill and organization, plus your invaluable handout. I'm thrilled to have a custom-fit pattern and look forward to completing my vest." Mary Beth L., Alaska cruise, 2008. "This past spring I attended the Chicago IQA Show. 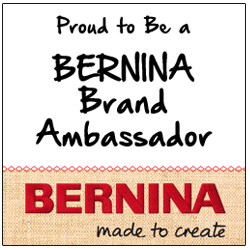 Bernina had a fashion show and your OLE' outfit was featured. The Jacket blew me away. I would love to make one similar." Karen K. of Greenwood, IN." "You gave such a great presentation at NCQC last year, and your curves quilt (Intersecting Rings) guild really sold it! I'm glad you decided to start teaching it!" Pauline O. 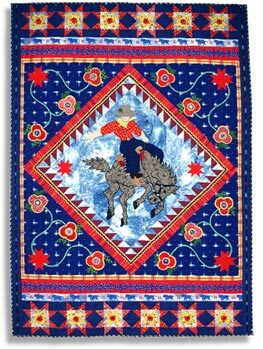 "I am pleased to inform you that your work has been selected for exhibition at The Santa Barbara Historical Museum exhibition, "Contemporary Art Quilts: The Best of California Quilters." The show is scheduled to open February 10 and will be on view through April 16, 2006." Re: Kokopelli's Spirit Horses ensemble (full-length coat with appliqués, slacks, vest, hat). Re: Lecture, "The Color Red"
This slide lecture reveals how Cathie found the freedom to use many different fabrics in her quilting and calls the approach "managed" chaos. She will use her travelogue photos in California, Nevada, England, and Morocco to illustrate how and why her exposure to color and design was influenced. 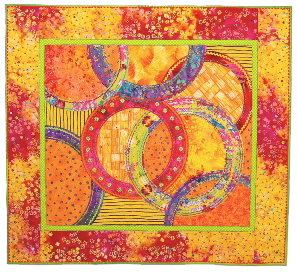 Her presentation of lots of quilt images will prove her point!" 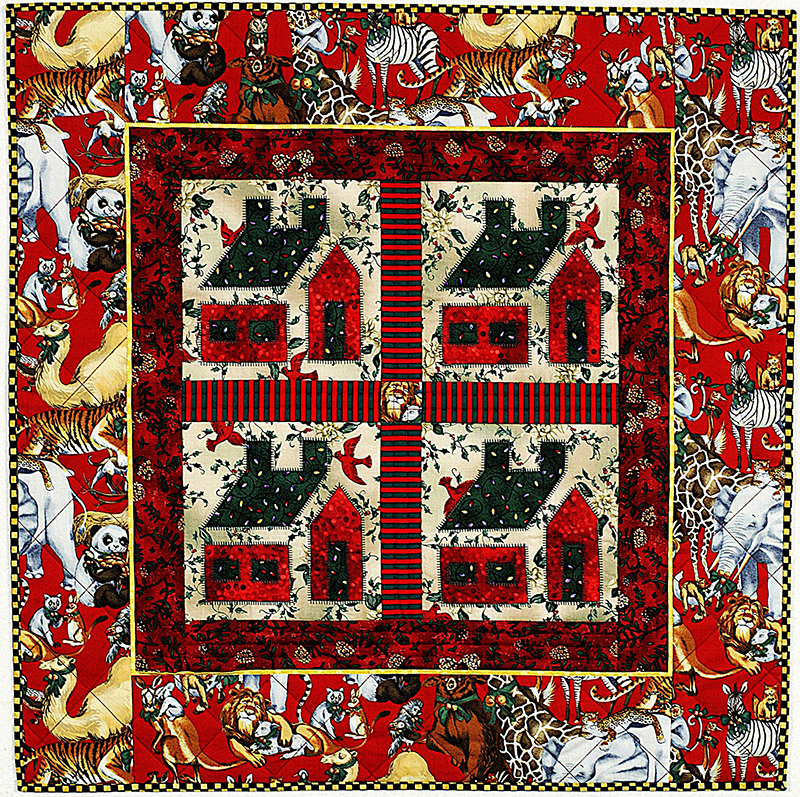 Village Quilters Newsletter, May, 2012. Re: Trunk show, "A Moo-ving Experience." 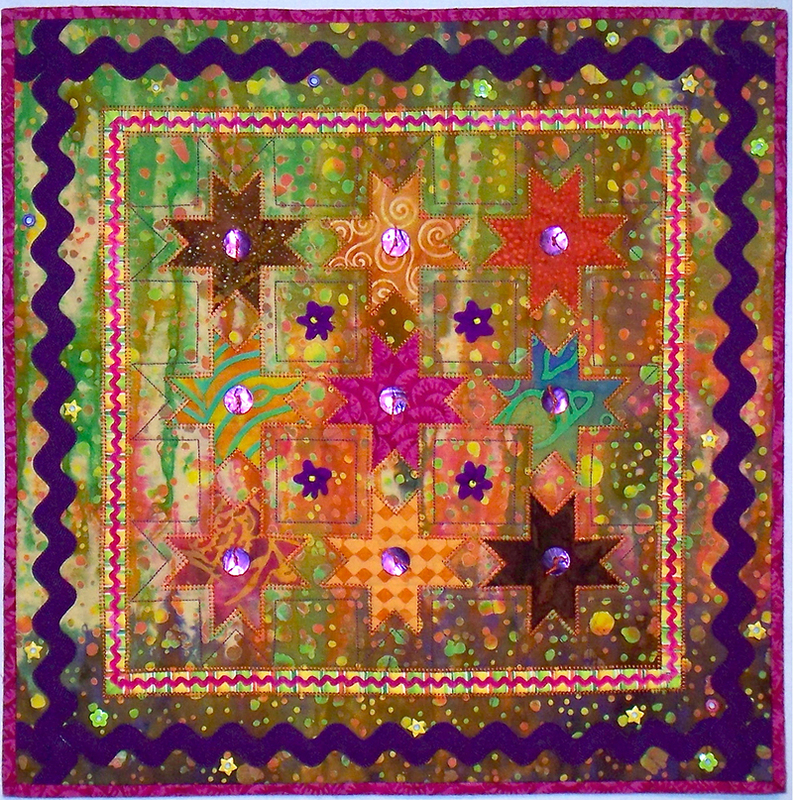 If you could ask the experts ,"What Do You See as the Greatest Challenge Facing Quilters Today?" "Time management is always a challenge – plus there are now zillions of quilt patterns, kits, books, TV shows, DVD's, local workshops, and fabulous regional retreats. How does a person choose? For me, it all goes back to the fabric – its quality, hand and appeal to me. I continue to build on the skills I have, and each and every project fortifies my ability to create anything I want to create." "I have seen her in action and her talks are dynamic, informative and fun. I am sure you will enjoy both her Saturday lecture and her Sunday workshop." 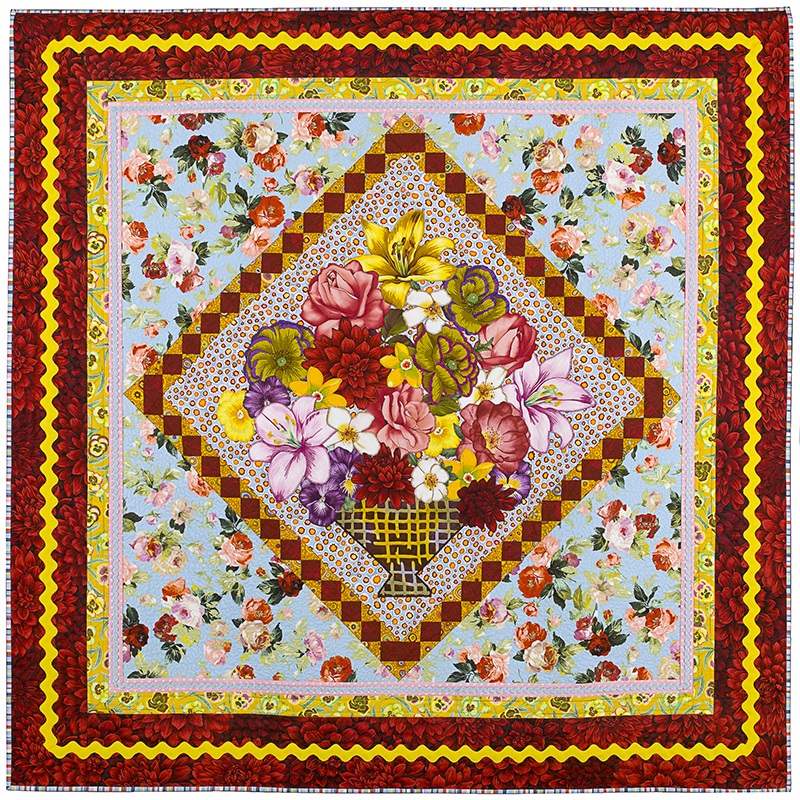 Sylvia Zeveloff, President, Empire Quilters, NYC, NY. "Cathie brought several of her vests to class, each more beautiful than the last. 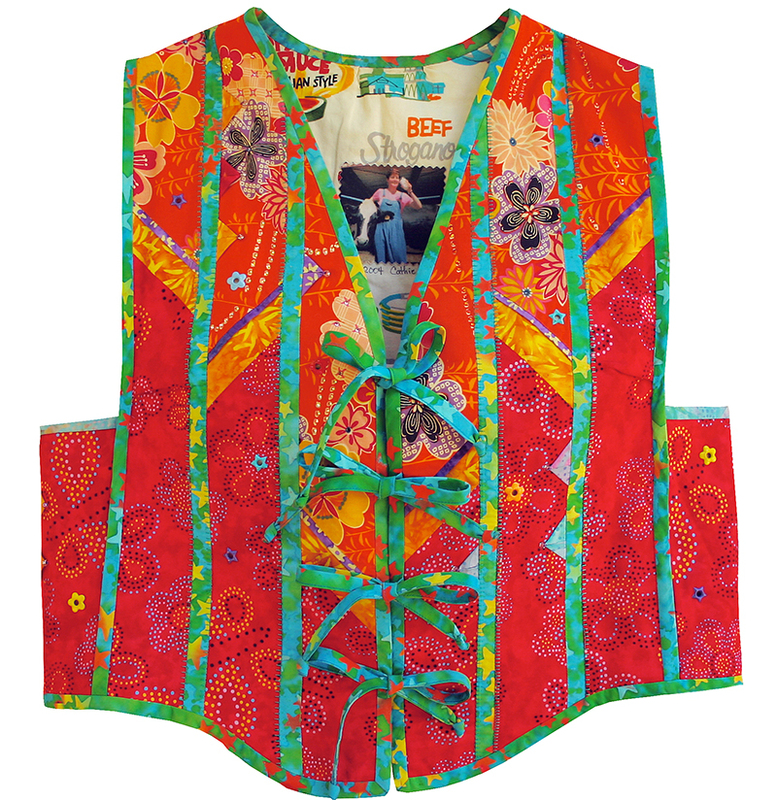 She measured each class member, and over the next two days the class learned all the ins and outs of creating a wearable art vest – from pattern, to color choices, to piping and appliqué"
"Cathie has an easy teaching manner. She is lighthearted, fun and quick. A look here, a comment there, and she turns a so-so fabric choice into something vibrant, or conversely, something subtle." 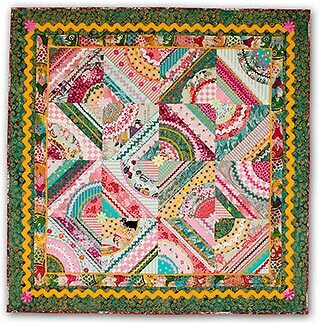 Learn an unusual technique for stitching complex pieced blocks accurately. Draw your own 14” - 17” design on freezer paper using a yardstick compass, or create a 42” x 46” wall quilt, which you can start in class using my original pattern. Don’t be confused, this is not paper-piecing! And, although this workshop features curved designs, the same technique is equally suitable for a linear design. Students will quickly see the design possibilities that can result when using this technique. 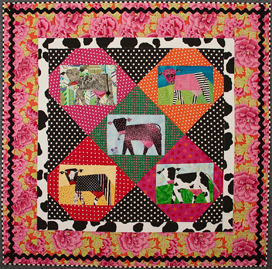 Create one or more cow blocks using an unusual techinque, which is not paper piecing, but it is more accurate! Bring your sewing machine and a few fabrics - sew up one block in a 3-hour workshop; in the 6-hour workshop, make five or more blocks. Select and arrange your printed flowers, and machine blanket. Students can bring large/medium/small scale, floral fabrics from their personal stash or a kit can be provided of currently available fabrics. 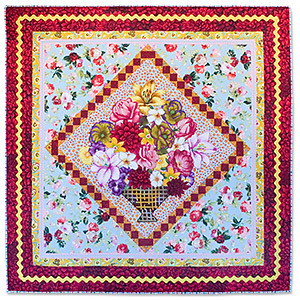 Either way, learn a new technique and find out how easy it is to create a "collaged floral" quilt! Class will concentrate on building the center floral medallion. Design choices for finishing this quilt will be discussed in class. Great fun for all – beginner through advanced! Techniques taught in this all-day workshop include: My award-winning machine reverse appliqué, Prairie Points and their application in 21st Century artwork, Afghani Piecework, Dimensional flowers and knots, Piping and Corded Piping, Rickrack flowers, and the use of rickrack and how to applied rickrack on quilts. Printed directions are provided for each student for future reference. This workshop is for both beginner and advanced quilters. Machine appliqué is my favorite method for creating my unique quilts and wearable art. This class features instruction in the appliqué techniques of: satin stitch, blanket stitch, soft-edge, and my original machine reverse appliqué. I will demonstrate and assist students in adjusting sewing machines for each stitch. Commercial aids for machine appliqué will be discussed. 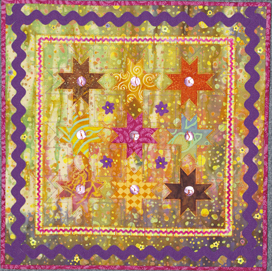 An excellent class for beginning and intermediate quilters! Make this Nine-Patch version of this traditional quilt with reverse applique using your sewing machine - no hand stitching! 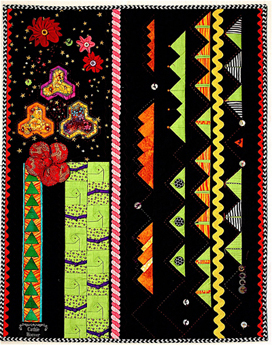 Create a traditional, scrap schoolhouse block using a variation of my reverse appliqué by machine technique. 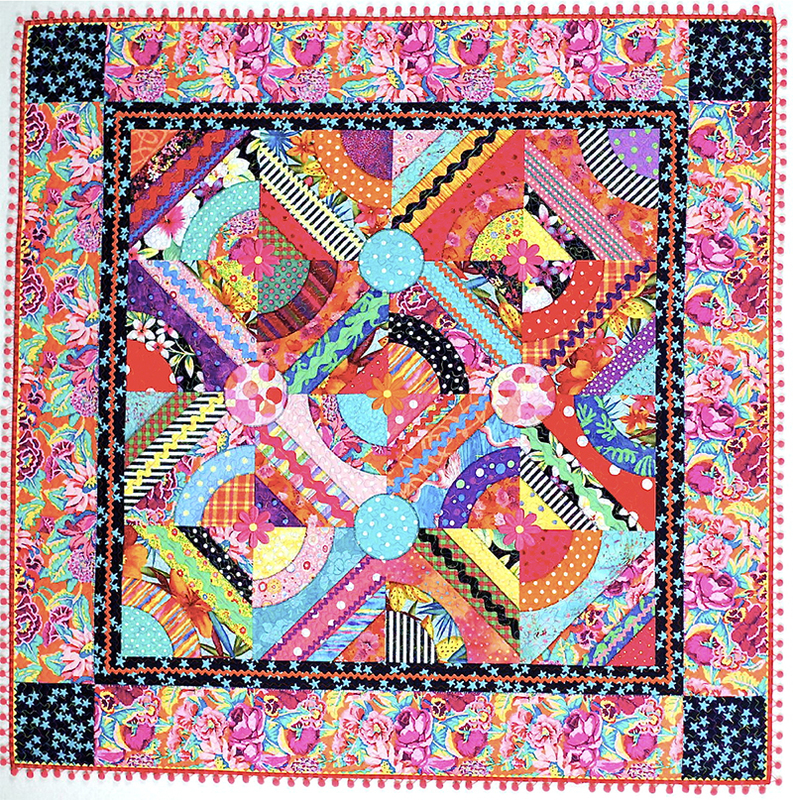 Bring dots, stripes, and a large scale print to make this crazy quilt. Add blender fabrics in the colors found in the large-scale print ( in light, medium and dark values). This block has both curves and straight, diagonal pieces, creating movement not found in traditional blocks. 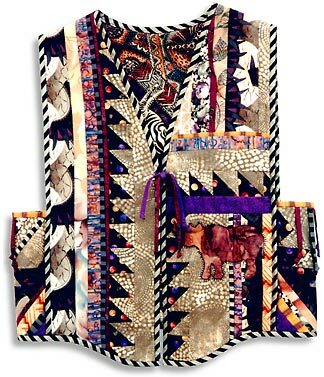 Embellish both blocks and finished top in rickrack, lace, braids and/or decorative machine stitching and fancy threads. Each student's fabric palette is evaluated and suggestions are made for maximum design impact. Make a one-of-a-kind patchwork vest in your color palette with my hands-on guidance, beginning with a muslin “test garment” to assure your fit. 2005 - 2017. All Rights Reserved. Cathie Hoover Studios. Website provided by Lisa Ellis of Giving Back Technology, LLC.